The droid R2-D2 holds within him a secret vulnerability of the Death Star, a vulnerability that will be exploited by the Rebellion to blow it up and save themselves from annihilation, the fate suffered by the peaceful planet Alderaan. Without Obi-Wan’s subtle, yet powerful Jedi mind trick on the stormtroopers, the story ends right then, right there, and evil triumphs. I have no idea if George Lucas patterned his Jedi mind trick on this short Bible story, but the two scenes do resonate. In both scenes, the characters are doing something that appears to be illicit: evading a search warrant in the case of Star Wars and stealing someone’s animal in the case of the Bible. Both evade the potentially troublesome situation with a few authoritative words. In both scenes people stand in the way of the next great plot point in their respective stories: in the case of Star Wars, chartering the Millenium Falcon with Han Solo and Chewbacca to get safely off of Tatooine with the droids; and in the Bible’s case, Jesus’s “triumphal” entry into Jerusalem on a colt as Messiah, fulfilling the prophecy of Zechariah. People may interpret this passage and say, “Jesus prearranged with those people to lend the colt to the disciples.” Therefore, Jesus gave those words to the two disciples to say as a prearranged passphrase signaling to grant permission. The Bible is silent about any such prearrangement. I think this small story is much more meaningful if we interpret it like a Jedi mind trick. “The Lord needs it” is then seen as a subtle statement of Jesus’s persuasive authority … when the situation calls for it. Curiously, the Mark 14 reading this morning ended with a similar statement of Jesus’s persuasive authority when he gives instructions for where and how to find the Upper Room for the Last Supper. Back to the summer of 1977. I am still nine years old. I am standing in a much longer line at the Field Museum waiting to see the exhibit of King Tutankhamun. It is the first time anything discovered by Howard Carter’s team in 1922 has been on display in the United States. The boy king of the New Kingdom in Egypt 3300 years earlier died at the age of 19, the age of Carrie Fisher when they shot Star Wars. Similar to the TV coverage of the lines to see Star Wars, the media is obsessed with the lines to see King Tut’s treasures. When the four-month exhibit is done, I will be one of nearly 1.3 million people to see King Tut’s treasures in Chicago. I am disappointed. After waiting in line for hours, I am unable to see much because my nine-year-old stature is easily squeezed out by people much bigger than me. The congested horde of humanity moves determinedly through the exhibit. When we finish snaking through the exhibit, my parents buy the glossy book of photos of the exhibit items. In the months and years after attending the exhibit, I peruse this book many times and marvel at the amazing display of wealth, artistry, and religious symbols to accompany the king’s afterlife. 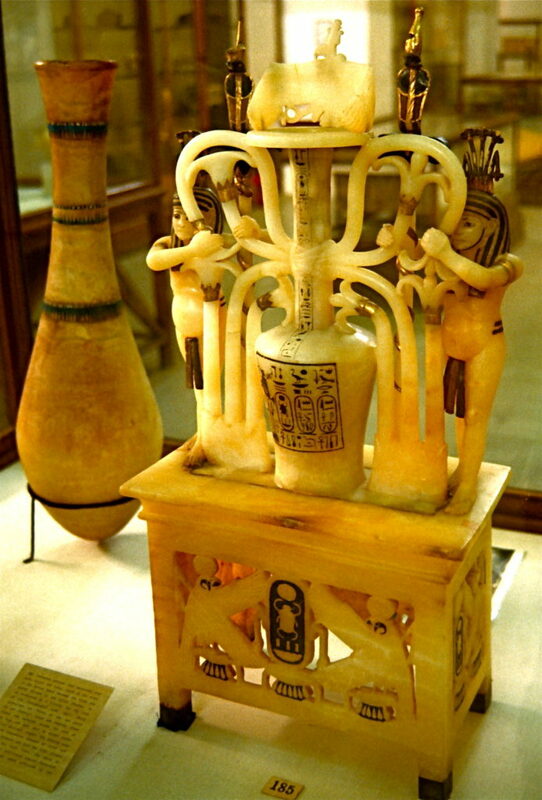 One of the artifacts in King Tut’s exhibit was an ornate alabaster container for perfume. Instead of describing this container I want to share a picture of it with you. When they found this it still contained some of its original “perfume.” They analyzed the substance and found the primary fragrant component was spikenard, which is not native to the Middle East; it is native to the Himalayas and grows at high altitudes. The cost to import spikenard and its scarcity in the region would greatly elevate its value. The perfume nard mentioned in Mark 14 is likely similar to the expensive nard stored for the eternal journey of King Tutankhamun 1300 years before the woman broke her own alabaster jar and poured the expensive perfume on the head of Jesus at the home of Simon the Leper. “Why this waste of perfume?” on a dead boy king sealed in a tomb? “Why this waste of perfume?” on an itinerant preacher challenging the authority of the empire? Why did they rebuke her? It had nothing to do with not wasting something expensive and instead selling it to benefit poor people. It had everything to do with not embracing the gravity of the situation that Jesus was in, one that could even lead to his death! Sometimes in the midst of grave situations we spend precious emotional energy and intellectual arguments consumed with things we see as under our control. “The poor you will always have with you, and you can help them any time you want.” Helping poor people is controllable, preventing state executions is way less controllable. In Star Wars Governor Tarkin threatens to blow up Princess Leia’s home planet of Alderaan to compel her to reveal the location of the Rebel base. She gives in and gives a deceptive answer: “They’re on Dantooine.” Governor Tarkin replies, “You’re far too trusting. Dantooine is too remote to make an effective demonstration. But don’t worry. 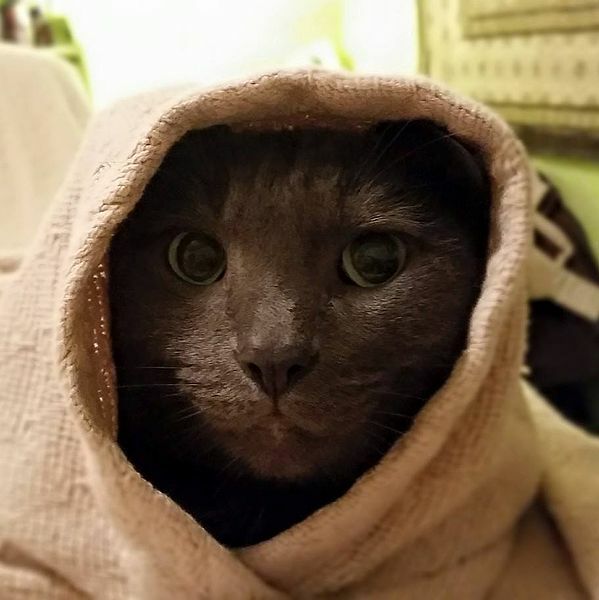 We will deal with your Rebel friends soon enough.” And then the Death Star shoots its massive death ray at Alderaan, a peaceful planet with no weapons. Because the Lord needs me … needs you … needs us. Evil wins some large scale victories, but goodness has a way of winning in the fullness of time through irresistible spiritual authority over the simplemindness of evil’s automaton nature to oppress and destroy. It is often only in hindsight that we see the difficult truth that the subtlety of irresistible spiritual authority beats the grandiosity of evil in the end. It’s easy to point out the major evils in the world and wonder about the oppressors, “Why are you doing this?” But why does it seem much less apparent to point out the subtle, everyday “Jedi mind tricks” of the world, the irresistible spiritual authority of some people and purposes, that lead in small ways to the triumph of goodness? Evil is often abrupt, shocking, and senseless. It’s newsworthy. Goodness tends to play the long game through subtlety, persistence, and the payoffs are often only discernible in hindsight. On Palm Sunday the disciples may have expected Jesus to enter Jerusalem as their triumphant messiah, conquer the empire, and create the eternal reign of God’s peace and justice as a result. As the week progressed, however, the disciples instead found themselves in a nightmarish storyline, one where their messiah would be wrongfully convicted in a sham trial, brutally tortured, and executed with common criminals. On Friday Disney released the teaser trailer for Star Wars Episode 9: Rise of Skywalker. Toward the end of the two minute teaser, we hear Luke Skywalker say, “We’ll always be with you. No one’s ever really gone.” It fades to black, and then we hear what sounds like the evil cackle of Emperor Palpatine, who was destroyed by Darth Vader / Luke’s father in a dramatic born-again conversion in Star Wars Episode VI: Return of the Jedi. The internet is abuzz with what these two minutes may foreshadow! Let us not be distracted by the motivations of others that we do not understand and instead focus on how we have been molded by the irresistible spiritual authority of key people in our lives.